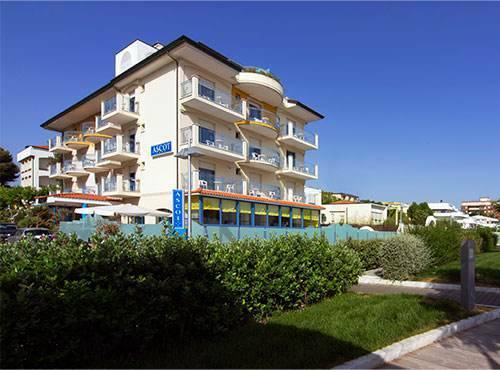 Hotel Ascot is inviting you to discover the heart of the Green Pearl of the Adriatic by offering a really central location for your holiday in Riccione. Here you can get to the beach without having to cross a single road as the Hotel looks out onto the pedestrian seafront of the town. From the breakfast room you can see the sea and it will only take you 5 seconds to step onto the sand. Beach Leo 58 opposite the Hotel offers special deals to all the Ascot guests. Here you will have a sun bed, a beach umbrella, hot and cold showers, changing cabins, entertainment, games areas, and family facilities. Do you like shopping and glam cafés and restaurants? The Ascot is your Hotel in Riccione that is only a 10 minute walk from viale Ceccarini and viale Dante, which are full of luxury shops. You will find single brand stores with the trendiest brands of the moment and renowned clothes, shoe and accessory boutiques. This is the right area for an aperitif or a typical Romagna dinner, to experience the traditional flavours of the Romagna Region. The Riccione Railway Station is 1 Km from the Hotel, and the staff will provide a shuttle service every time you decide to travel by train and leave your car in the Ascot car park.